Stephen Curry frees himself for the long bomb on Kobe Bryant who gives his respect after. Wir vermuten, dass dieses Video anstößige Inhalte zeigt? Helfen Sie uns und melden Sie das Video Kobe Gives Curry Respect After Draining Long Three. Kobe Gives Curry Respect After Draining Long Three. 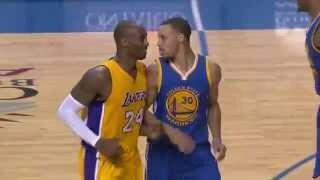 Alternative Binge: Stephen Curry frees himself for the long bomb on Kobe Bryant who gives his respect after.